Building apps has never been faster, thanks in no small part to advancements in virtualization. Lately, I’ve been exploring better ways to build and deploy apps without having to worry about ongoing front-end work, such as patching Linux machines, replacing them when they fail, or even having to SSH into systems. In this two-part tutorial, I will share how to build a Node.js app with MongoDB Atlas and deploy it easily using Amazon EC2 Container Service (ECS). Launching it locally in a development environment. In part two, we'll get our app running in a Linux container on AWS by installing some tools, configuring a few environment variables, and launching a Docker cluster. By the end of this two-part tutorial, you'll see how to work with Node.js to start an application, how to build a MongoDB cluster for the app, then finally, how to use AWS to deploy that app in containers. Docker makes it simple for developers to build, ship, and run distributed applications across different environments. It does this by helping you “containerize” your application. What's a container? The Docker website defines a container as "a way to package software in a format that can run isolated on a shared operating system". More broadly, containers are a form of system virtualization that allows you to run an application and its dependencies in resource-isolated processes. Using containers, you can easily package application code, configurations, and dependencies into easy-to-use building blocks specifically built to run your code. This ensures that you can deploy quickly, reliably, and consistently regardless of the deployment environment, and allows you to focus more on building your app. Moreover, containers make it easier to manage microservices and support CI/CD workflows where incremental changes are isolated, tested, and released with little to no impact to production systems. 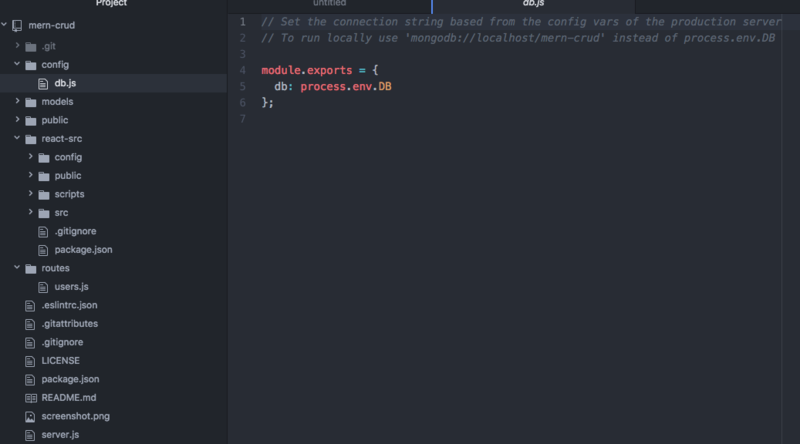 In the example we'll walk through in this post, we're going to build a simple records system using MongoDB, Express.js, React.js, and Node.js called mern-crud. We'll combine several common services on the AWS cloud platform to build a fully functional, containerized application with auto-scaling and load balancing. The core of our front end will be run on Amazon EC2 Container Service (ECS). In part one, I'll set up our environment and build the application on my local workstation. This will show you how to begin using MongoDB Atlas along with Node.js. In the second part we'll wrap everything up by deploying to ECS with coldbrew-cli, an easy ECS command line utility. Below you'll find the basics of building an application that will allow you to perform CRUD operations in MongoDB. Amazon EC2 Container Service (ECS) allows you to deploy and manage your Docker instances using your AWS control panel. For a full breakdown of how it works, I recommend checking out Abby Fuller's "Getting Started with ECS" demo, which includes details on the role of each part of the underlying Docker deployment and how they work together to provide you with easily repeatable and deployable applications. This permits coldbrew-cli to use our user rights within AWS to create the appropriate underlying infrastructure. Next, we'll work with coldbrew-cli, an open source automation utility for deploying AWS Docker containers. It removes many of the steps associated with creating our Docker images, creating the environment, and auto-scaling the AWS groups associated with our Node.js web servers on AWS. The best part of coldbrew is that it's highly portable and configurable. The coldbrew documentation states the following: coldbrew-cli operates on two simple concepts: applications (apps) and clusters. An app is the minimum deployment unit. One or more apps can run in a cluster, and, they share the computing resources. We'll use this utility to simplify many of the common tasks one would have to do when creating a production ECS cluster. It will handle the following on our behalf: Manually, all of the tasks listed above would take a nontrivial effort. To install coldbrew-cli, we can download CLI executable (coldbrew or coldbrew.exe) and put it in our $PATH. ECS will allow us to run a stateless front end to our application. 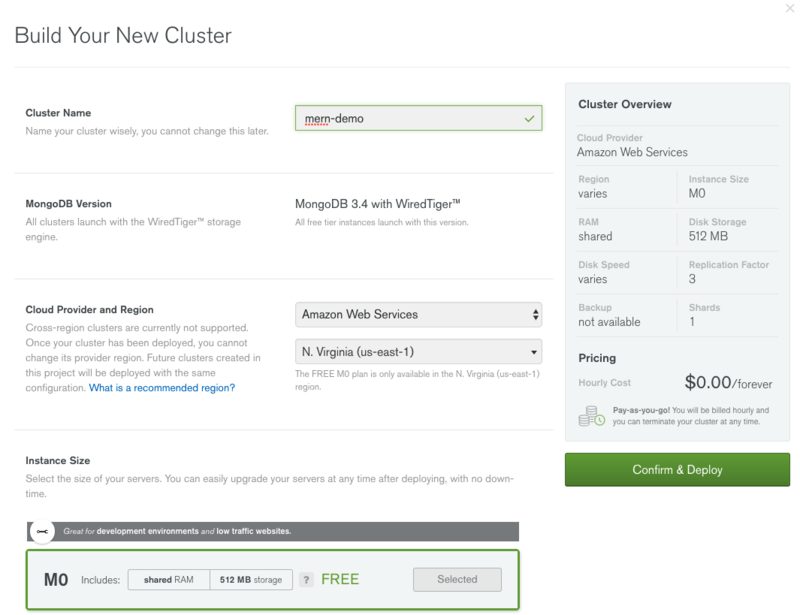 All of our data will be stored in MongoDB Atlas, the best way to run MongoDB on AWS. In this section, we’ll build our database cluster and connect our application. We can rely on coldbrew commands to manage deployments of new versions of our application going forward. Building an Atlas cluster is easy and free. If you need help doing so, check out this tutorial video I made that will walk you through the process. 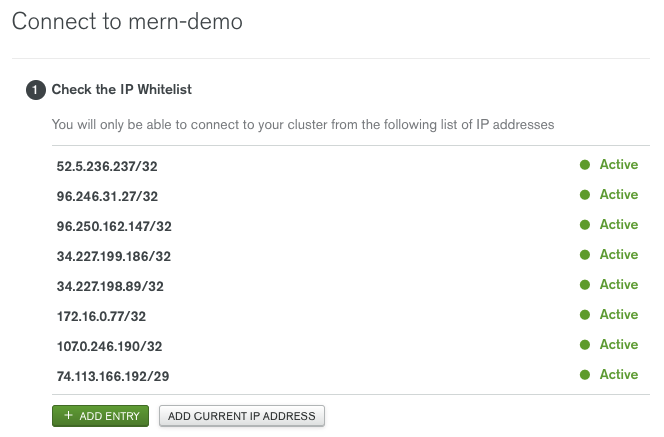 Once our free M0 cluster is built, it’s easy to whitelist the IP addresses of our ECS containers so that we can store data in MongoDB. I named my cluster "mern-demo”. remote: Counting objects: 303, done. Receiving objects: 100% (303/303), 3.25 MiB | 0 bytes/s, done. The server.js app is reliant on the database configuration stored in the config/db.js file. We'll use this to specify our M0 cluster in MongoDB Atlas, but we'll want to ensure we do so using user credentials that follow the principle of least privilege. Let's create a basic database user to ensure that we are not giving our application full rights to administer the database. All this basic user requires is read and write access. 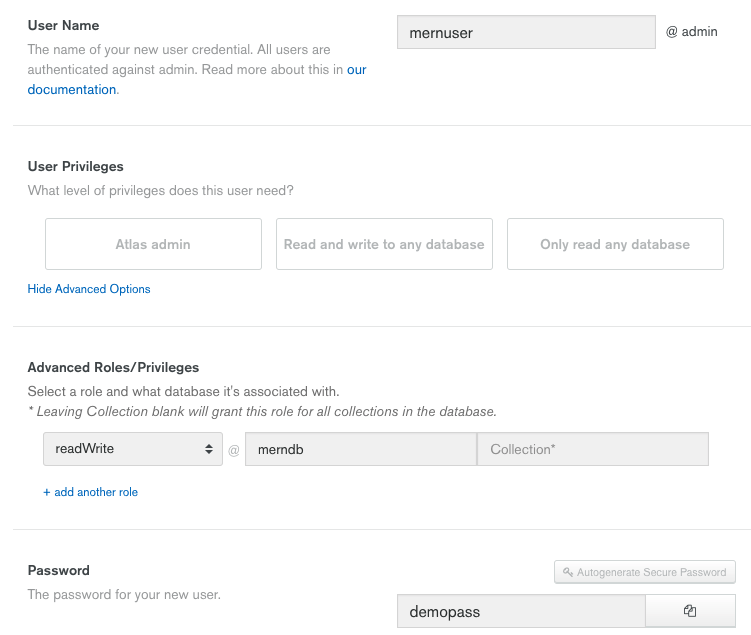 Now click the "Add new user" button and create a user with read and write access to the namespace data is being written to within our cluster. We now have a user ready to access our application's MongoDB Atlas database cluster. It's time to get our connection string and start prepping the application. Our connection string can be accessed by going to the "Clusters" section in Atlas, and clicking the "Connect" button. The username and password should be replaced with the credentials we created earlier. We also need to specify the merndb database our data will be stored in. Let's add our connection string to the config/db.js file and then compile our application. The hardest part is over, the next part is deploying with coldbrew-cli, which is just a few commands. In part two of this series, we’ll cover how to launch with coldbrew-cli and then destroy our app when we're finished. Jay Gordon is a Developer Advocate at MongoDB focused on providing users with a great experience with Cloud products. He joined MongoDB in 2016 after many years as working as a System Administrator and DevOps Professional.